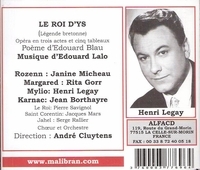 “Henri Legay was a French operatic tenor, primarily French-based as his light lyric voice was especially suited to the French operatic repertoire. Born in Paris, he won First Prize at the Conservatoire de Paris in 1947, and began his career singing operetta. He made his operatic début at La Monnaie in Brussels in 1950, also appearing in Lausanne. He began a long association with the Opéra-Comique in 1952, as Gérald in LAKMÉ, quickly establishing himself as one of the leading tenors of his time. He left a few recordings, LES PÊCHEURS DE PERLES, LE ROI D'YS, and most notably MANON, opposite Victoria de los Ángeles and conducted by Pierre Monteux, widely regarded as the definitive recording of Massenet's opera. Along with such early twentieth century tenors as David Devriès, Georges Thill and Léopold Simoneau, Legay represented a lost style of French operatic singing. Jean Borthayre is proof that a French baritone can sing with great warmth, full-bodied tone, immaculate diction and fine musicality. Borthayre has it all going for him. This glorious voice is heard here in a mainly French program….This is one of the most pleasing recital discs to come my way in a very long time – grand singing at its grandest."